I arrived at Utah’s Arches National Park later than I planned on September 14 this past year. Still, I was fortunate to get a lovely moonrise and some gorgeous colors (deepened a bit on Picassa). I hope to show some daytime shots of Arches, Bryce, and Zion soon. Utah was fantastic. I had no idea! February 20, 2008 was a clear, frigid night. I set up my tripod at about 9:15 p.m. and made my first exposures at about 9:35 p.m. I had my Nikon D200 set on remote control, and I remember that my hands kept freezing up as I removed my warm gloves to press the shutter release repeatedly. I took my last photo of this full lunar eclipse at 2:37 A.M. the next morning (Feb. 21) . In total, I make 216 exposures at varying apertures and shutter speeds. I tried matrix metering and center-weighted metering, but I had the most success with spot-metering. Again, I varied exposure, but I usually underexposed by one to three full stops. I used ISO’s ranging from 500 to 1000 and apertures from 5.6-11. 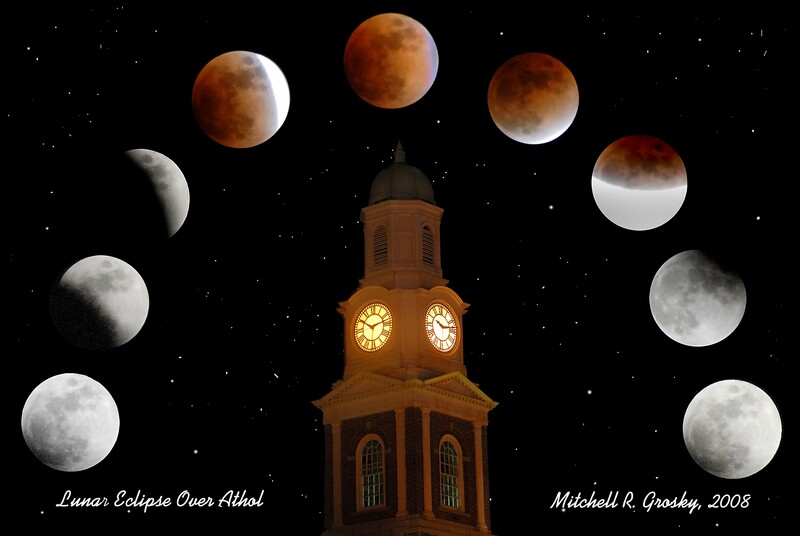 I created the moon collage over the next several days, and then photographed the town hall on a clear night about a week later. I combined the photos in Photoshop Elements 6.0.